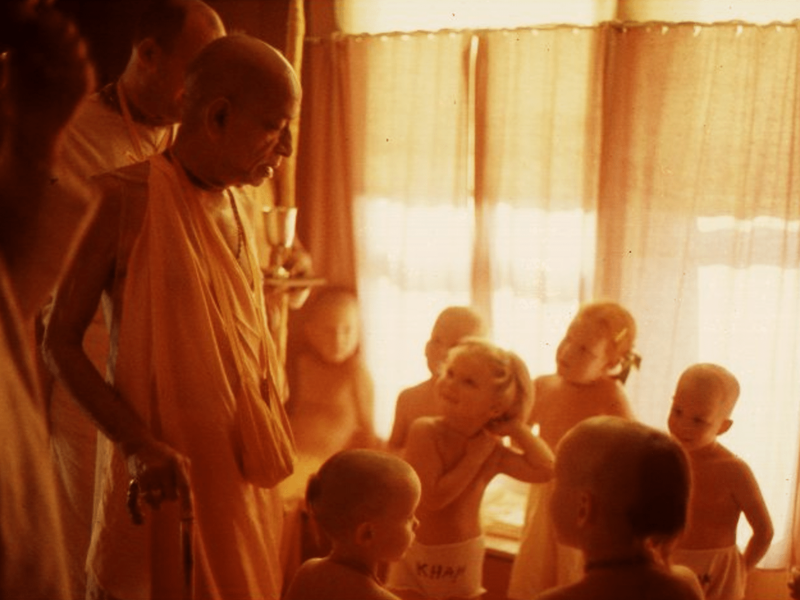 Bhaktivendanta swami returned to delhi with a purpose the paper and printing capital of india was in the chandni chow section of old Delhi and he thought it was best to somehow locate himself there to regularly negotiate for printing book through an old printing contact he met a temple owner who gave him a room in his radhakrishna temple near chandni chow the neighborhood was called chippiwada a congested mixed hindu muslim quarter now bhaktivendanta swami could work either in Vrindavan or Delhi with new enthusiasm he picked up a few donation and began publishing back to godhead and at the same time he began his translation and commentary of srimad bhagavatam. Bhaktisiddhanta das years before when, i was one of the first devotees visiting chippiwada, I started a painting on the roof above where srila prabhupad stayed when I was making the preliminary drawing and old lady lived on the roof of this building approached me and asked what i was doing I told her that my spiritual master used to live here and i wanted to show others the view from his roof I gave her some BTG that i had and was surprised when she opened the downstairs room some days he would work all night and then suddenly disappear I never knew what he was doing but he had a big vision he told me one day his mission would spread all over the world and now you tell me this true he was a true gentleman and pure at heart I am so happy to hear this great news. Why build new temples? Why not renovate and use old temples? Great! You have Successfully registered for Srila Prabhupada Lila Newsletter. You will hear from us shortly.